Wired Magazine has posted their Top 100 Quotes Every Geek Should Know and I have to say, some of them are good. And since I love quotes (I really do), here are a few of them. SciFi Guy has the cover and blurb for a new book that has caught my eye. 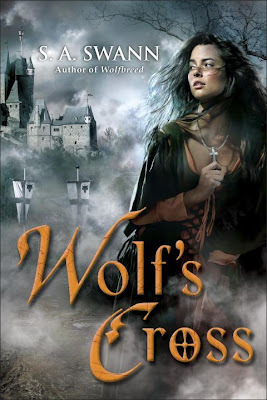 I’ll be honest, I can’t remember the first novel in this series, Wolfbreed, but the cover for Wolf’s Cross by S.A. Swann is catching my eye. Wolf’s Cross will be released July 27th. Leanna Renee Hieber has posted a few excerpts for her upcoming novel, The Darkly Luminous Fight for Persephone Parker, the second in her Strangely Beautiful series. Patricia Briggs has a treat for her forum members. She’s posted a portion of the first chapter for the next Mercy Thompson novel, Silver Borne. If you haven’t had enough of Pride and Prejudice and Zombies, then guess what…io9 reports that Quirk books will be releasing a prequel titled Pride and Prejudice and Zombies: Dawn of the Dreadfuls. There isn’t any news on when it will be released, but I’m going to go with sometime this year. Babbling About Books is pimping out a few novels coming out this year. There are a few covers that look really hot, so head over if you’re a cover junkie like me or just want to see what’s coming out at some point this year. Donna Grant and Bitten by Books is giving away a Barnes & Noble Nook Ereader in celebration of the release of Dangerous Highlander. Contest ends January 11th. Chloe Neill and Bitten by Books is giving away a signed copy of Firespell, a Firespell gift pack and a $100 Amazon Gift Card. Contest ends January 8th. Thanks for the heads-up about the Mercy excerpt. So love those books! Thanks for the Briggs news and the cover mention. Sorry I haven’t been commenting RL has kept me way too busy.